New Design – Best Dressed Hexes! When my local bead store (Beaded Bliss in Harrison, OH) got in the new two-hole Hex Pyramid beads I had no idea what to do with them. They were beautiful, and the shop owner had purchased lots of gorgeous colors, but they were huge! 12mm of pointed glass glory. 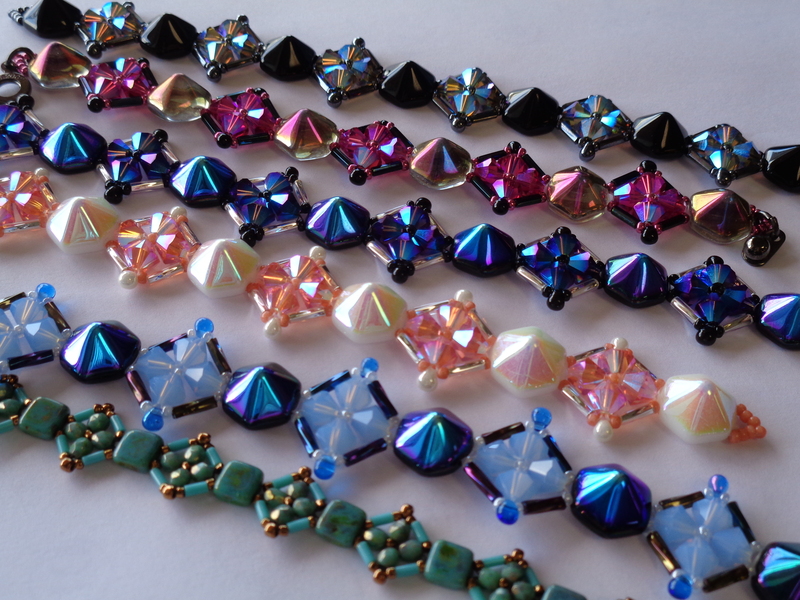 All my design ideas felt way to delicate for such substantial stud beads. Then I thought to make crystal motifs that were even bigger than the hex pyramids – thus making them seem smaller. And… voila! 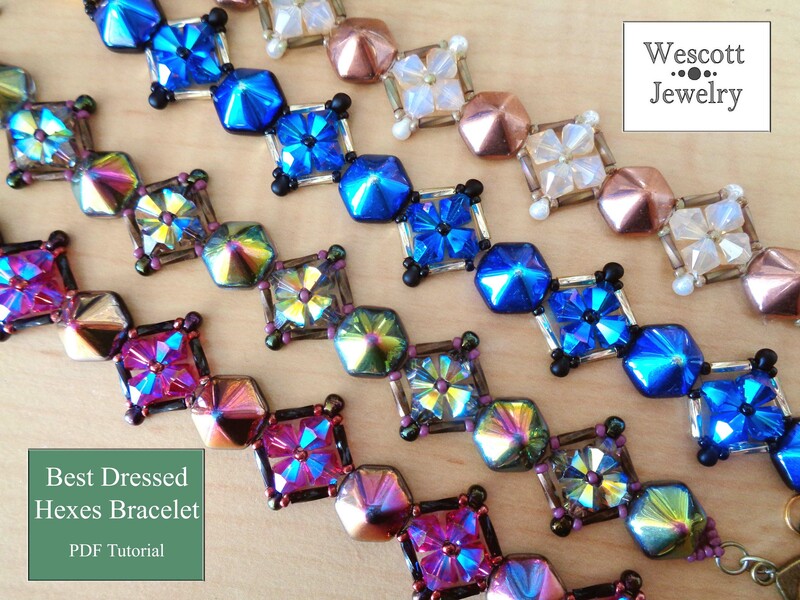 My Best Dressed Hexes Bracelet was born! There are so many color options for this bracelet. I have four pictured here and another four sets of colors sitting on my beading table waiting to be put together. One of them became my demo set for the class I taught at Beaded Bliss this past Saturday. The ladies there are always so kind to proofread my patterns before they go online. And they let me take pictures of their finished bracelets! You’ll notice that the turquoise version is made much smaller. My friend, Rose, decided to experiment with switching out the beads for half-sized substitutions. Didn’t it turn out lovely? I’m not the only one using Hex Pyramids. Deb Roberti just published a free pattern that uses them as well. You can find her pattern and post about it here. 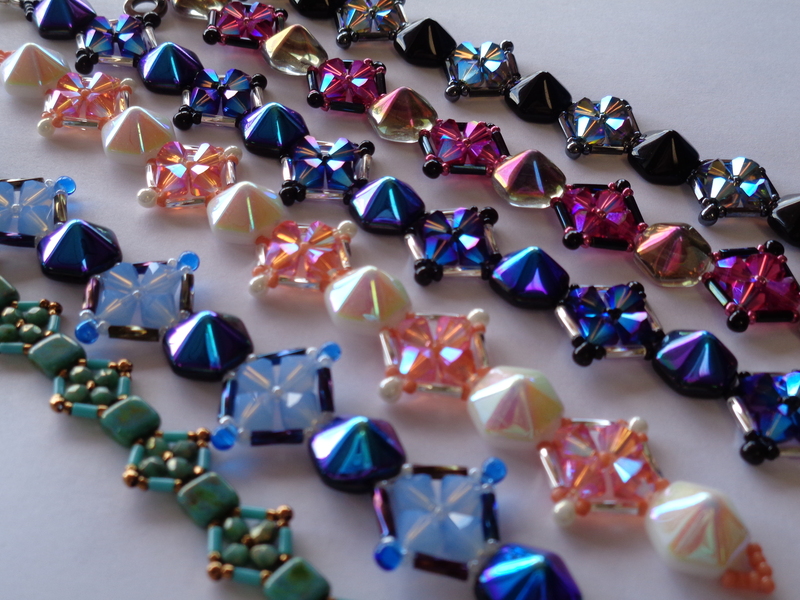 I am so excited to see what other designers are going to do with these pretty beads. Check your local bead shop for them or maybe check out Aria Design Studio or Red Panda Beads to get your own set and experiment! What about you guys? Have any of you made anything with the Hex Beads? This entry was posted in New Pattern Annoucements and tagged art, arts and crafts, bead pattern, bead tutorial, bead weaving, beading, beadweaving, beadwork, crafts, hex pyramid, hex pyramid beads, jewelry, jewelry design, jewelry making, pattern, tutorials, two hole bead tutorial, two hole beads, two hole beads pattern. Bookmark the permalink.